New Blackberry from Cingular? | BlackBerry Blast! BlackBerry Blast! > News > New Blackberry from Cingular? 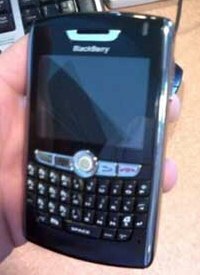 A post went up on HowardForums today with a link to a picture of what is said to be a Blackberry 8900c by Cingular. Prevailing wisdom around the web seems to say that this is actually an 8800. The first version of this upcoming Cingular Blackberry is said to be without a camera. BBHub has also published five pictures of the same unit. Check the link below for the pictures.